View the Annual Meeting Schedule with up to 20.50 CME credits are available! Check out the special events section on the For Attendees web page to find out details about the STORM Alumni Preceptor Reunion, Wine Tasting & Auction, President’s Dinner and more! June 5, 2019 | 1:00 – 5:30 p.m. 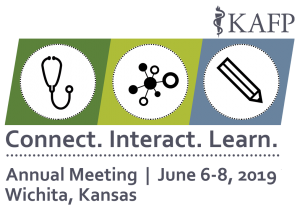 This Live activity, Kansas-AFP 2019 Annual Meeting, with a beginning date of 06/05/2019, has been reviewed and is acceptable for up to 20.50 Prescribed credit(s) by the American Academy of Family Physicians. Physicians should claim only the credit commensurate with the extent of their participation in the activity.